For years, marketers have ranked email as their top performing marketing channel. As text messaging platforms evolve and consumers’ preferences continue to skew toward speed and immediacy, texting will give email a run for its money. Add all these tasks up and you’re talking about 24.5 hours, on average. 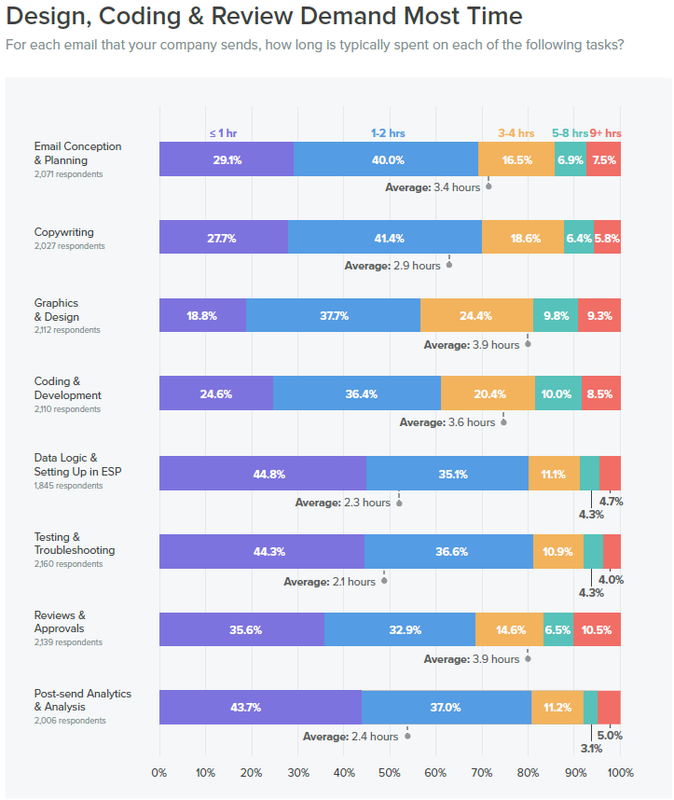 The email marketers surveyed in this report also said that these hours span at least two weeks to reach completion, given the handoffs and routing workflows between teams and departments it takes to get the work done. Don’t get me wrong, many texting tools require the same effort as shown in the report above. A simple campaign can take 3-4 weeks, more sophistication can take months. That’s a problem we wanted to solve. And we did. With Converse. Your marketing users creating and deploying proven campaigns, easily and effortlessly. Your team intelligently managing more conversations, more responsively and seamlessly across every stage of your pipeline, from lead to opportunity to account. Having the analytics insights you need for every messaging campaign, right at your fingertips. To make this a reality, we’ve prepackaged customer-proven best practices in every Converse App, speeding your time to messaging campaigns. Each app is purpose-driven so that you can choose what you need to achieve your goals—from simple single blast messages to sophisticated multi-faceted campaigns. Need to build your subscriber list? We’ve got an app for that. Want to learn more about your customers? Our progressive profiling app has you covered. Your product is a considered purchase, so you need to nurture prospects along their buying journey? Our nurture app sets you up for success. Are you having an event and you want to encourage registrations and promote special opportunities? Use our events app. Take surveys, schedule appointments, send offers and promotions or anything else you dream up without need for developers or heavy technical lifting. Converse apps include content, automated workflows, global messaging services, and powerful data management, along with integration to leading platforms, like Salesforce, ready to go. All you need to do is tweak the message content templates to suit your needs and brand and you’re ready to go. The cool thing about text messaging is that it’s conversational. Rather than just pushing information at your prospects and customers, like you do with email, you can invite two-way conversations that build better relationships and trust with every interaction. You won’t need to worry about how you’ll manage all this because we’ve also created Converse Desk. The Desk is an intuitive messaging interface designed like an email inbox, inviting your users to get hands-on with little training. Even better, it has an intelligent guidance system that creates a virtual worklist for your users, making it fast and easy for your users to find any conversation and manage multiple conversations. You’ll never miss another opportunity and your responsiveness will impress your prospects and customers and show them how attentive you are to their requests, queries, and needs. Businesses that take 2 weeks or more to craft and deliver communications to prospects and customers will find their ability to engage them diminishing. Sixty-nine percent of respondents to CCW Digital’s recent study on customer experience view speed-to-communications as a top priority. And, 64% want interactions that require less effort. Intelligent text messaging can help you deliver on both. Not to mention that your marketers will be more productive and can focus on creating the most relevant messaging possible, not on the technology that powers them.